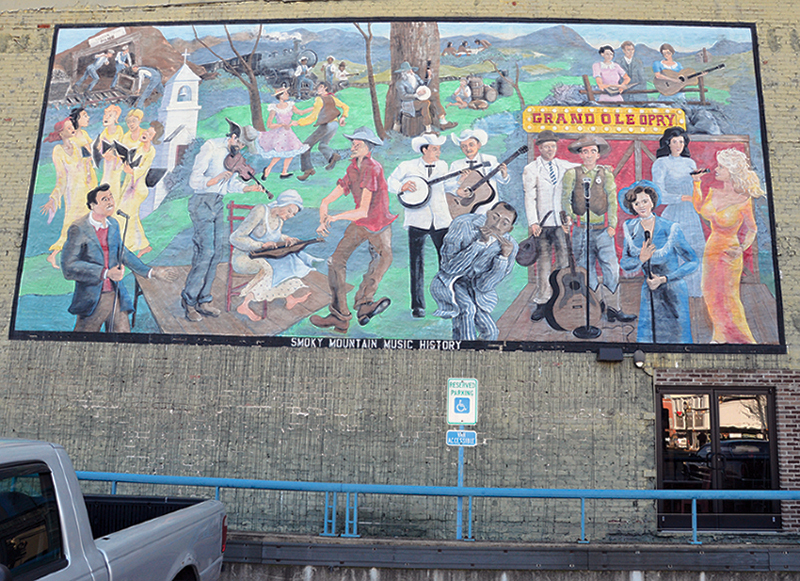 A large mural depicting the history of music in the Smoky Mountains is painted on a brick wall next to a parking lot in downtown Maryville, Tennessee (Artist – Henrietta Foy; Muralists – Walt Fieldsa and Katie Gamble). I often admired the colorful mural when parking and have taken time to digest it on many occasions. A color snapshot of the wall is shown below. 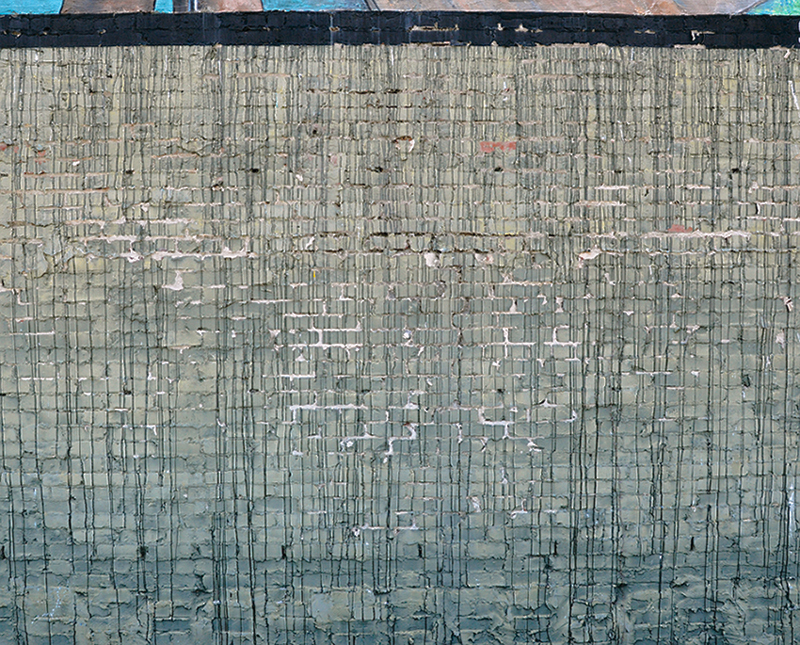 I never had an urge to photograph the wall until I noticed that the wall below the mural showed evidence of the painter’s work – numerous streams of colored paint that had trickled down the brick. The color snapshot below shows an area that is similar to the black and white photograph discussed in today’s blog. The color snapshot (after histogram stretching to increase contrast) shows that colors beneath the mural are muted and are particularly suitable for black and white photography. The mural was large and many bricks below it contained paint streams so numerous compositions could be selected from the available patterns. When photographing things, I usually try to define the subject of my photograph as clearly as possible to guide the layout of my composition. 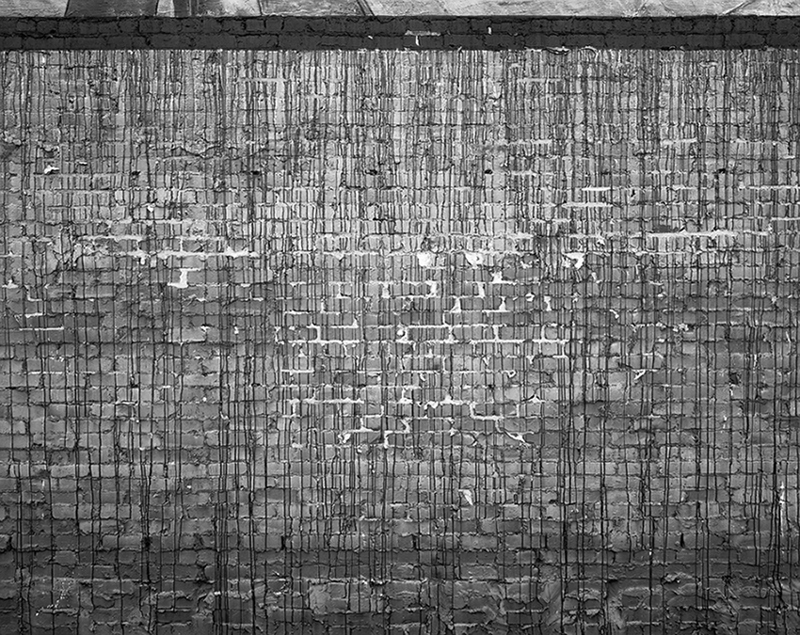 The subject of today’s photograph was “artist’s paint which fell on the brick wall when the mural was painted.” To capture that subject, I needed to show enough of the mural to make sense of the paint below it but the photo’s emphasis had to be the actual paint streams on the brick wall. To create visual flow within the composition, I relied on geometric and tonal variations by contrasting the mostly horizontal, bright mortar with the mostly vertical, dark paint streams. To help demarcate the boundaries of the composition, I anchored its top with the black stripe and included two splashes of bright paint to help anchor the composition’s left, right and bottom boundaries. The two paint splashes are somewhat subtle but can be seen near the lower left corner and the lower right edge of the first image shown in this blog. The wall was in complete shade and the light on it looked quite flat so a few light meter readings were acquired to see how flat the scene actually was. The black stripe near the top of the composition was placed on Zone III (dark with good detail) to render the stripe dark but retain structural detail within it. The brightest areas of mortar fell on Zone VI (slightly brighter than middle gray). These light meter readings showed that the wall was indeed quite flat tonally. I thought that the brightest mortar areas should be substantially brighter than Zone VI so I made a note on the exposure record to develop the film N + 1 3/4 (read as normal plus one and three quarter zones). That development moved the brightest mortar areas from Zone VI to Zone VII 3/4 (read as zone seven and three quarters) while leaving the black border nearly the same at Zone III. Zone VII 3/4 (very bright with a little detail) would render the brightest mortar areas quite bright but still retain a hint of texture in them. I mounted a 120 mm lens on my 4 inch x 5 inch view camera (150 mm is a “normal” focal length for 4×5 cameras) and used its levels to tilt the camera’s lens and back so they were accurately parallel to the wall to eliminate the distortions seen in the two color snapshots shown above (recorded with a Nikon D7000 digital camera). The ability to manage distortions is a major advantage of view cameras and is particularly important when photographing geometric subjects like today’s brick wall. I acquired one black & white image by exposing a sheet of Tri-X film at 1/4 sec and f/45. The film was scanned with a drum scanner to acquire a high resolution digital file at my usual resolution of 5,000 ppi and 16-bit pixel depth. The digital image obtained from the scanner without editing is shown below. My first impressions of the scanned image were good. Bright mortar areas retained plenty of detail for editing, the black stripe near the top contained pure black pixels (but looked slightly weak overall) and I liked the composition’s strong geometric components. The beautiful light on the lowest six rows of brick was a surprise because I hadn’t noticed it while working at the scene. The lowest six rows were especially good because they helped demarcate the bottom of the image. It usually is better to define the boundaries of an image using elements within the image rather than using the physical edges of the image. I frequently use PhotoShop’s Curves for editing because they can deal with several tonal issues simultaneously and a curve adjustment layer was opened for the first editing action of today’s photograph. Objectives of the curve edit were to slightly brighten light mortar areas, strengthen the black stripe near the image top, strengthen the dark paint streams and develop more texture within the bricks. 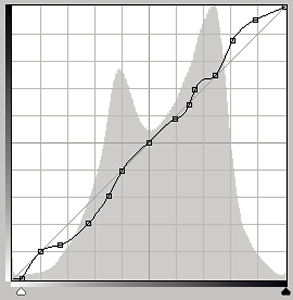 The user interface for the Curve adjustment is shown below with tones that progress from light-to-dark beginning at the lower left corner. The hand icon in the curve box was dragged over specific image areas to identify sections of the curve that corresponded to each image area. This showed that the brightest pixels in the histogram represented mostly light mortar areas. Those pixels were brightened further by moving the white slider to bend down the appropriate section of the curve at its bright end. The black stripe near the image top and the dark paint streams were strengthened by bending up the appropriate section of the curve toward its dark end (except pure black). More texture was developed within bricks by lightening their brighter tones and darkening their darker tones. The hand icon was particularly useful for identifying curve sections that corresponded to those brick tones while avoiding other image areas. A broad range of brighter brick tones were lightened by bending a substantial section of the curve downward. Darker brick tones were darkened by bending a short section of the curve upward. The following image contains the curve edits. 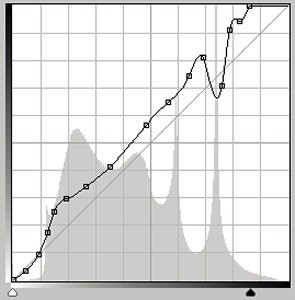 Comparing it with the previous image shows that curve edits were effective at achieving the editing objectives. That is, light mortar areas were brightened slightly, the black stripe near the image top was strengthened, dark paint streams were strengthened and more texture was developed within bricks. I was most happy with the bricks because the curve edit seemed to develop three-dimensional depth in a subject that was very flat physically. Next, Local retouching was performed using PhotoShop’s Burn and Dodge tools. The original image layer (image from the scanner) was duplicated, named “Retouch” and placed directly above the original layer. Three objectives were identified for retouching. First, the left, right and bottom edges of the photograph were burned slightly darker to help turn viewer’s eyes inward. Second, some brighter areas of mortar were dodged slightly brighter to strengthen the contribution of mortar to the geometry of the photo and help move viewer’s eyes through the image. Third, a few areas of bright paint were dodged brighter; most notably the splash of paint near the lower left image corner. I was pleased with the image displayed on the computer monitor so a 16 inch x 20 inch test print was made to evaluate my editing progress thus far. The test print looked good except for the tendency of my eyes to fall off the top of the image. I thought that the best way to help prevent that was to reduce the visual strength of the painted mural area bordering the top edge of the photograph. To accomplish that, PhotoShop’s Magnetic Lasso tool was used to select the painted mural area above the black stripe and a Curve adjustment layer was opened for the selection. The Curve adjustment user interface for the selection is shown below. The hand icon in the curve box was dragged over painted areas to identify curve sections that corresponded to specific areas of mural paint. The curve above shows that the brightest mural areas remained unaltered but most other mural areas were darkened. Mural areas that were not darkened corresponded to large areas of dark paint. These edits reduced the visual strength of the painted mural area without rendering it tonally flat. The following image adds the final curve edit to the previous image. Another test print was made and I was happy with it. I like this photograph and think that it provides an interesting perspective on a painter’s work. The photograph prints nicely at any size and all print sizes contain good details and good tones. The subject of this photograph was artist’s paint which remained on a brick wall after the Smoky Mountain Music History mural was painted in Maryville, Tennessee. Any comments you might have about the image, the photographic approach used for it, its composition, or image workup will be appreciated. For a larger view of this photograph, visit here.